May 29, 2018: While clouds are an important topic of research for climatologists and meteorologists, sometimes the atmosphere churns up peculiar-looking cloud formations that are as notable for aesthetic reasons as they are for scientific ones. That was the case in May when this circular swirl of clouds drifted over Lake Balkhash in eastern Kazakhstan. The Moderate Resolution Imaging Spectroradiometer (MODIS) on NASA’s Terra satellite acquired the image at roughly 12:05 local time (06:05 Universal Time) on May 22, 2018, and the MODIS on Aqua acquired a similar image roughly two hours later. While the MODIS sensors are affixed to polar-orbiting satellites and take an image of each part of Earth once per day, the Indian Space Research Organization operates a geostationary satellite—INSAT-3DR—that keeps its gaze fixed on this part of the world and captures new images every 26 minutes. Imagery from INSAT-3DR helps fill in the gaps before, after, and between the two MODIS images. 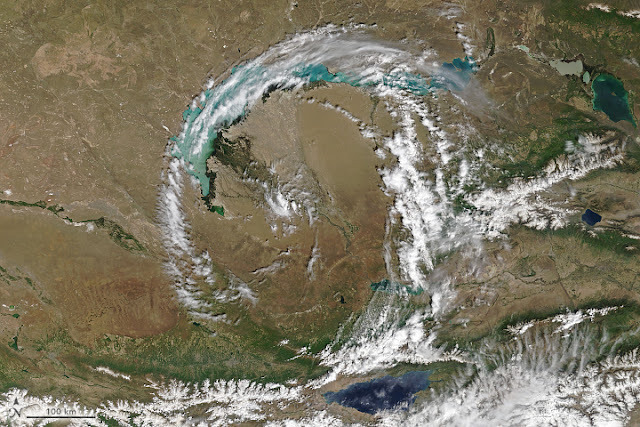 The INSAT-3DR imagery suggests that a few hours before Terra MODIS acquired the image, the circular feature was linked to an area of convection to the southwest over the western Tien Shan mountains. Cyclonic wind flow drew the clouds into the circular pattern, which had a radius of roughly 200 kilometers (100 miles)—small enough that meteorologists would classify it as a mesoscale feature. In contrast, synoptic scale features have horizontal lengths greater than 1,000 kilometers, while microscale features have widths less than 1 kilometer.